Superconducting tunnel junction (STJ) technology offers tremendous potential for the next generation of space-borne astronomical X-ray missions as well as for optical astronomy. STJs have intrinsic energy-resolution and time-tagging capability and are sensitive across a broad energy range. One problem, however, is that each device in an array needs to be individually biased and read out, requiring at least one electrical connection per pixel. This requirement hampers the development of large-area arrays. In close-packed arrays with individual pixel read-out, like in S-Cam, there is a limitation to the maximum array size, mainly due to the wiring problems. One way to solve this problem is the application of matrix read-out. 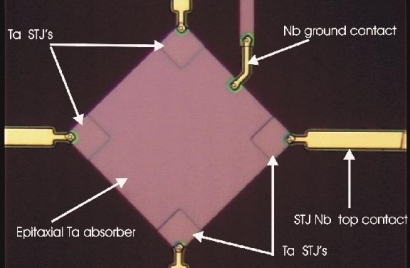 Another alternative are large-area absorbers which use STJs for collection and read-out of the photon induced excitations (Distributed Read-Out Imaging Detectors or DROIDs, originally proposed by Kraus et al.). These can be realized as 1-D linear structures with STJs at the end or 2-D structures, for example with STJs at the corners of a square absorber. In a DROID, photons are absorbed in a single, large-area crystal (or a smaller polycrystalline layer), at the corners or edges of which are situated individual STJ's. The diagram below shows the working principle of a DROID: charge carriers induced by the absorption of a single photon will diffuse across the absorber and reach the STJs at both ends. This will give rise to signals with amplitudes depending on the original photon absorption position. This position can be derived from the difference of the two amplitudes, whereas the photon energy can be reconstructed from the sum of the two amplitudes. Time-coincident event measurement therefore allow the energy and position of an incoming photon to be measured. Thus, the DROID could replace conventional close-packed array of STJs, at the possible expense of some energy resolution and the requirement to sustain a low count rate. The Detectors and Optics group has been investigating the viability of 1- and 2-dimensional DROIDS as optical/UV detectors with the emphasis on spatial and energy resolution. Diagram a): signal amplitudes s1 and s2 from the two STJs at the end of a 50×200 micron DROID, illuminated with 296nm (4.20eV) photons. 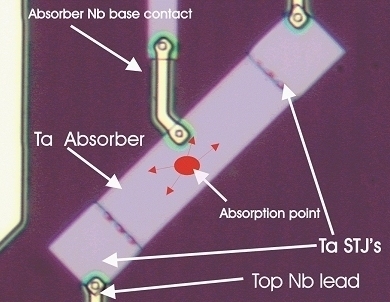 Absorptions in the absorber as well as in the two STJs can be clearly distinghuised. Currently, 1D DROIDs are considered is the most realistic building blocks for larger arrays. The geometry of these individual DROIDS is still under investigation. S-CAM 4 (link to SCAM4), one of the future generations of our STJ-based camera for ground-based astronomy, is foreseen to use a DROID-based array.